A quadmesh is a dense mesh describing a topologically continuous surface of 4-corner primitives. This is also known as a cell-based raster but in those contexts the corner coordinates and the continuous nature of the mesh is completely implicit. By making the dense mesh explicit we have access to every corner coordinate (not just the centres) which allows for some extra facilities over raster grids. arbitrary reprojection of raster cells without information loss (mesh_plot). 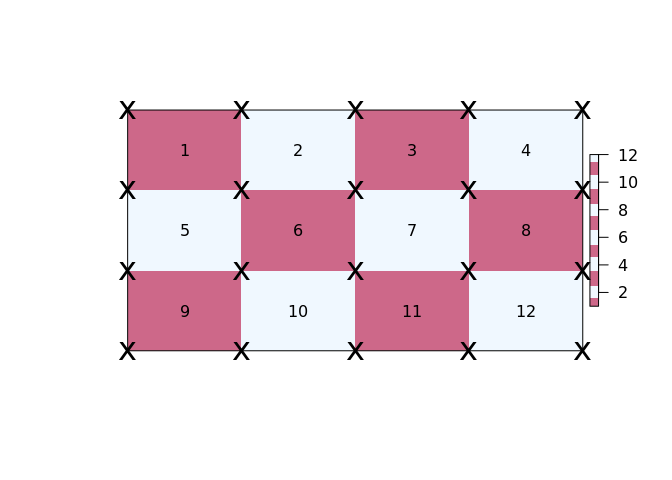 the corner-based continuous interpretation of a grid (quadmesh()). the centre-based continuous interpretation of a grid (triangmesh()). 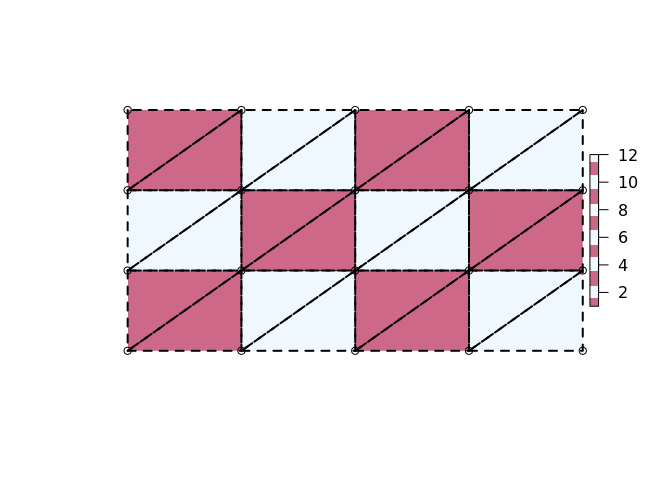 the corner-based discrete interpretation of a grid (dquadmesh()). the centre-based discrete interpretation of a grid (dtriangmesh()). easy plotting of grids in 3D visualization tools (quad or triangle primitives for rgl::shade3d). fast polygonization of individual cells, in spex::polygonize. barycentric interpolation from a triangle mesh (bary_index()). conversion from quad to triangle primitives from the area interpretation (triangulate_quads()). Quadmesh provides a number of key features that are not readily available to more commonly used geospatial applications. 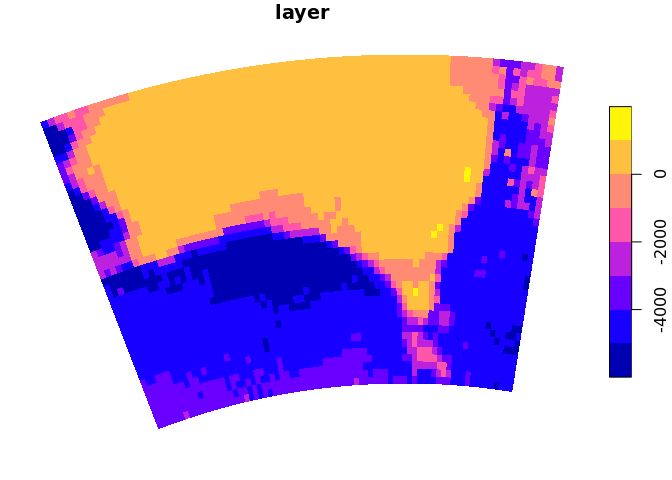 In raster there is an implicit “area-based” interpretion of the extent and value of every cell. Coordinates are implicit, and centre-based but the extent reflects a finite and constant width and height. Every individual quad is described implicitly by index into the unique corner coordinates. This format is built upon the mesh3d class of the rgl package. This separation of geometry (the 20 unique corner coordinates) and topology (12 sets of 4-index) is the key concept of a mesh and is found in many domains that involve computer graphics and modelling. A quadmesh is centre-based, and each raster pixel occupies a little rectangle, but the centre-based interpretation is better described by a mesh of triangles. Every centre point of the grid data is a node in this mesh, while the inside corners with their ambiguous value from 4 neighbouring cells are not explicit. Note that a triangulation can be top-left/bottom-right aligned as here, or bottom-left/top-right aligned, or be a mixture. Quads are trivially converted into triangle form by splitting each in two. Note that this is different again from the centre-based triangle interpretation. 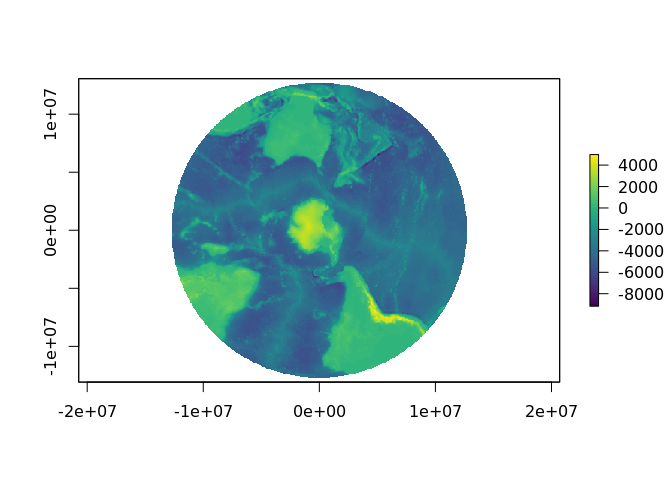 The in-built etopo data set is used to create a plot in a local map projection. Here each cell is drawn by reprojecting it directly and individually into this new coordinate system. prj <- "+proj=lcc +lat_1=-36 +lat_2=-38 +lat_0=-37 +lon_0=145 +x_0=2500000 +y_0=2500000 +ellps=GRS80 +towgs84=0,0,0,0,0,0,0 +units=m +no_defs"
## This is faster to plot and uses much less data that converting explicitly to polygons. The data size and timing benefits are more substantial for larger data sets. We get exactly what we asked for from mesh_plot, without the complete remodelling of the data required by grid resampling. pol <- "+proj=stere +lat_0=-90 +lon_0=147 +datum=WGS84"
The quadmesh and triangmesh types are extensions of the rgl class mesh3d, and so are readily used by that package’s high level functions such as shade3d() and addNormals(). 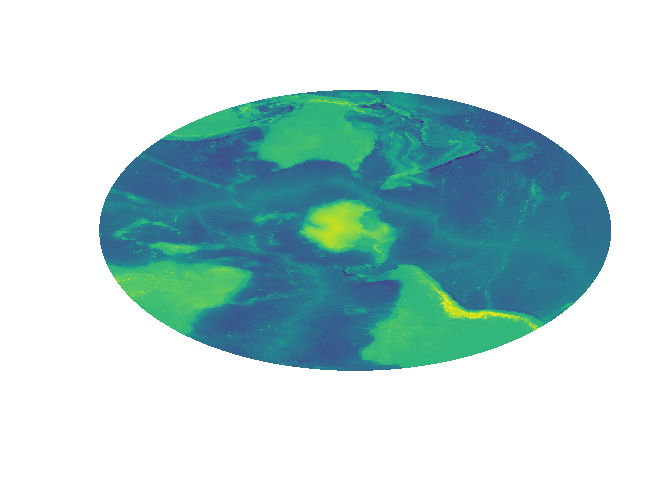 The spex package has functions polygonize() and qm_rasterToPolygons_sp() which provide very fast conversion of raster grids to a polygon layer with 5 explicit coordinates for every cell. (stars and sf now provide an even faster version by using GDAL). Using a triangulation version of a raster grid we can build an index of weightings for a new of of arbitrary coordinates to estimate the implicit value at each point as if there were continuous interpolation across each primitive. WIP - see bary_index() function. Have feedback/ideas? Please let me know via issues. Many aspects of this package have developed in conjunction with the angstroms package for dealing with ROMS model output. Now using the reproj package for coordinate transformations. New mesh_plot() method for TRI objects from silicate/anglr. 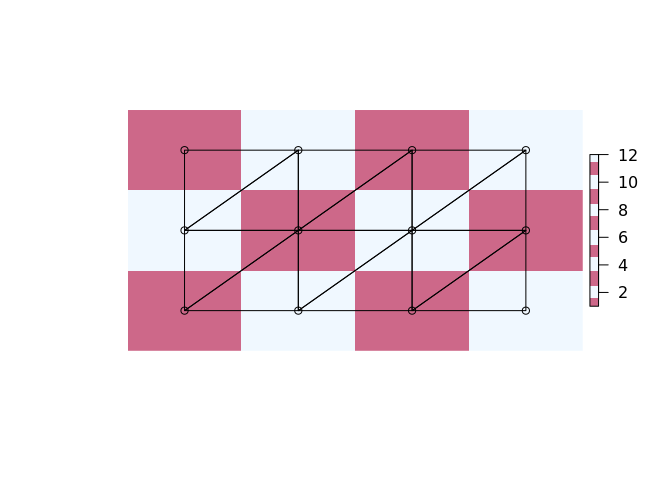 New function dquadmesh to provide the discrete interpretation of a grid. New function bary_index to provide a basis for interpolation of a regular grid from triangles. New functions triangmesh() and dtriangmesh to provide the triangle-interpretation of a raster (bound to centre coordinates). quadmesh() is now generic with a new method for 'matrix'. Some fixes and additional features for mesh_plot() to allow plotting with curvilinear coords. New function qm_as_raster to round-trip to a RasterLayer. The z argument of quadmesh() may now have a different coordinate system to the input data x. The mesh coordinates of x are silently reprojected if needed and used to extract values in the native coordinate system of z. A new qsc function to return a very simple six quad rendition of the Quadrilateralized Spherical Cube projection family. 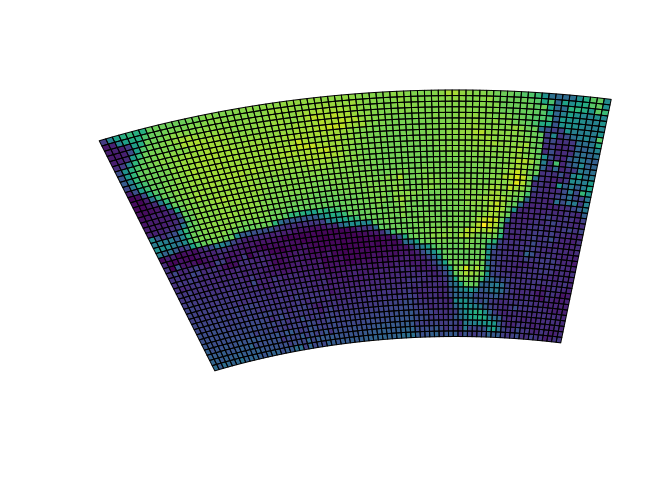 The mesh_plot function gains true curvilinear grid support by allowing input of coords, a two-layer raster of longitude and latitude values for the cell geography. This aligns with the approach used in the angstroms package. The quadmesh function gains a new argument 'texture_filename' to control the output PNG file. The quadmesh functions gains a texture argument, to map on a 3-layer RGB raster (in 0-255) via a temporary PNG file. New function mesh_plot for basic vectorized raster plot with optional near near-lossless projection transformation. Index arrays are now created with integer mode. Added triangulate_quads function to convert quad index to pairs of triangle index. Added supporting information to package. Internal function llh2xyz is now exported to transform from longitude latitude coordinates to geocentric xyz coordinates.